Last week, students at our North Bridge House Canonbury campus took to the stage of the King Edward’s Hall for the Senior School and Sixth Form’s very first drama production. Gracing the hall with its first performance since 2003, the founding cohort of Year 9 and 12 students impressed and humoured friends and family with their performance of Mark Ravenhill’s teenage comedy, Totally Over You. 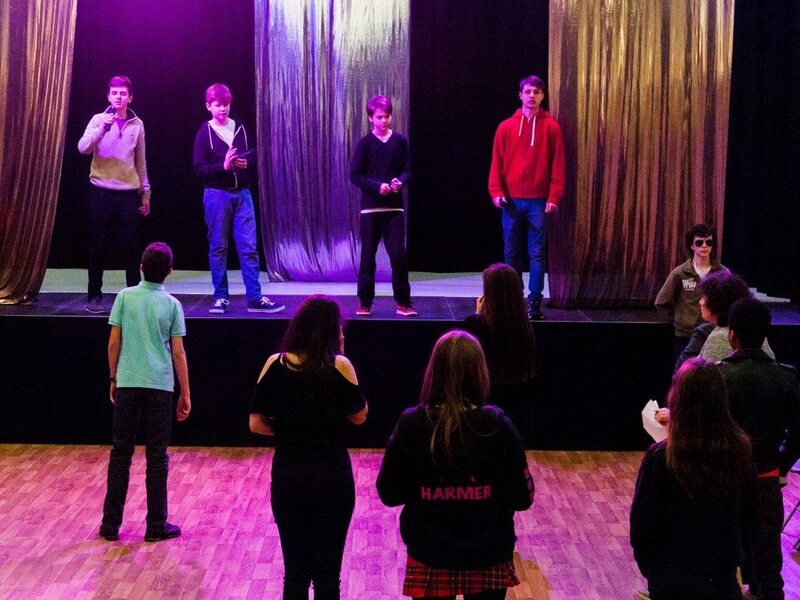 After having spent the last two months rehearsing, dedicating their time after school and during lunch times to perfecting their parts, our students’ hard work paid off and they put on two fantastic performances. Their innovative use of the floor as well as the stage drew audience members into the story, with seating arranged in a circle around the performance space. Totally Over You was first performed at the National Theatre, London in 2003 as part of the National Theatre’s Connections project, which commissions playwrights to produce plays for young people to perform. Loosely inspired by Molière’s Les Précieuses Ridicule, the satire is based around four girls who ditch their boyfriends in a bid to become famous by marrying celebrities. The four boys seek revenge by fooling the girls into thinking they have been signed by a record label and are about to become a famous boy band. Led by Kitty, the girls then set out to win them back. North Bridge House Senior School & Sixth Form Canonbury restored the King Edward’s Hall, formerly known as the Tower Theatre, when it opened in September 2014. Since then, the hall has been used for a number of community evenings as well as Drama and Theatre Studies tuition, so that NBH Canonbury can entertain local residents for many of whom the Tower Theatre was a landmark building. The King Edward’s Hall was home to the amateur acting group, the Tower Theatre Company for 50 years, and brought various household names into the limelight, including veteran stage actress Siân Phillips, English blockbuster actor and voice actor Alfred Molina, and star of stage and screen, Sir Michael Gambon. Judith graduated from Pembroke College at the University of Oxford and went on to achieve a Masters in Performance Arts, a Postgraduate Diploma in acting and a PGCE. In addition to teaching at a range of prestigious London schools, Judith has pursued her passion for acting, performing at the Edinburgh Fringe Festival and working with a range of theatre companies across the UK. She brings both inspiration and expertise to her role at NBH Canonbury, and continues to strive to develop the school’s Drama and A-Level Theatre Studies department.